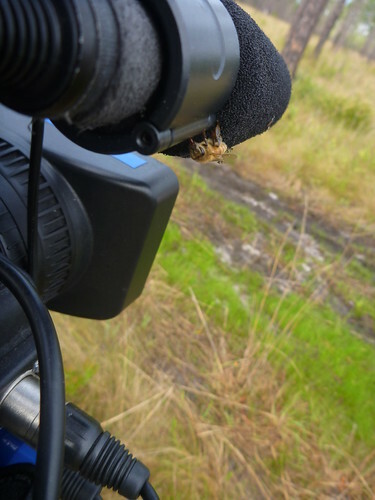 Wildlife watching is big business in Florida. In a state with the unique natural resources we have, that’s no surprise. The Florida Fish and Wildlife Conservation Commission has determined that it brings, more or less, $5 Billion to Florida a year. When we say wildlife watching, we usually mean birds and butterflies. Animals that are cute, colorful, and/ or ferocious. What Eleanor Dietrich wants you to consider is that wildlife watching could also mean wildflowers. And just as it is thrilling to watch an eagle or a heron catch a fish, carnivorous plants might be the most thrilling of wildflowers. Luckily for those in our area, the Apalachicola National Forest in Liberty County is a hot spot for these strange and beautiful killers. 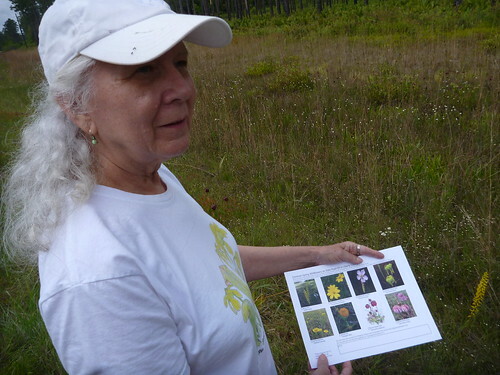 Eleanor Dietrich holds one of her free self-guided Liberty County Wildflower tour guides. She has several local businesses distributing these with the idea that wildflower populations could benefit the local economy. State Road 65 between Hosford and Sumatra is unofficially the Liberty County Wildflower Trail. For many, this is the scenic route to St. George Island. What Eleanor wants people to do is to pull over every once in a while to notice the incredible life peeking through the top of the grass growing on the shoulder. She has enlisted local businesses to help distribute free self-guided tour maps, and helped create a partnership between Tallahassee Artist Helen Dull and Pam Richter, owner of T&P Florist and Gift Shop in Hosford. Helen’s renditions of carnivorous flowers grace shirts, tote bags, and post cards at the T&P. It’s seasonal. Just as certain hummingbirds pass through the St. Marks Refuge in late spring, certain flowers bloom at a certain time every year. The Chapman’s rhododendron usually blooms for a couple of weeks in March. 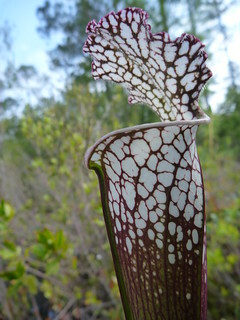 Carnivorous plants in and around the Apalachicola National Forest start blooming in April and go through early May. Another set of wildflowers explodes there in the fall. You never know what you’ll see. If you go birding, you’re not guaranteed to see any specific bird. It’s the same with these flowers. When we got there, the yellow trumpet pitcher plants had lost their flowers, but their remarkable pitcher leaves retained their strong presence in the woody tangle surrounding the New River. Purple pitcher plants were going strong and the dewthread sundews were just beginning to flower. In a week, it would look entirely different. These flowers bloom in waves, and there’s no fixing a specific date on when they’ll start. Location, location, location. We went to three different spots within a twenty mile range: two roadside locations and one further into National Forest. One roadside spot had non native Venus flytraps and showy white topped pitcher plants (pictured to the left), the only place where we saw them. In the forest, we saw an abundance of yellow trumpet leaves and of the sticky dewthread strands getting ready to flower. At the second roadside spot, we had to do a little searching to find the carnivorous plants among the wildflowers. It helps to dress appropriately. The day before our shoot, FSU Biologist Dr. Tom Miller, who accompanied us, warned me to wear closed toed shoes. You’ll see why in the video. He also suggested a long sleeved shirt to minimize gnat biteage and that I spray that nasty bug spray on my socks to discourage ticks. The best places to see the really cool plants and critters aren’t always comfortable. Carnivorous plants are found in what are known as a ecotones. Ecotones are the spaces where one ecosystem overlaps with another. The Apalachicola National Forest has some well maintained longleaf pine/ wiregrass habitat, with the characteristic wide spacing of trees. Through the trees you may see dense tangles of wood surrounding rivers or other wet places. Carnivorous plants can be found in the seam between the two. As you may know, all life needs nitrogen (if you didn’t know, Dr. David Kimbro broke it down for us last year). Plants usually get it from the soil, where bacteria can convert it into a useable form (David explains it better than I do), and where decomposing plants add to it as well. Animals get their nitrogen from plants. The bogs where carnivorous plants grow have soils that are low in nutrients. The plants get their nutrients from the bugs they eat. A controlled burn on S.R. 65 on the day of our shoot. Carnivorous plants are dependent on fire ecology. More specifically, they are dependent on disturbances to clear spaces for them. 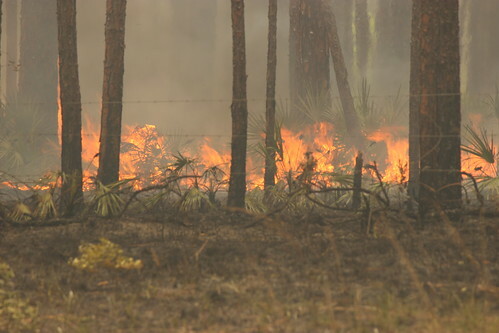 Longleaf pines maintain their spacing through regular fire. It clears the forest floor of oak and other woody plants and makes space for wiregrass and succulent plants. That fire also clears a space at the fringe of the forest, where the pretty killer flowers live. Annual mowing along highway 65 also helps. The spot where we saw the white tops and Venus flytraps had a crew go through in recent months, installing telephone poles. These flowers are pretty resilient. They need wet conditions, but during the harsh droughts of the last fifteen years, Dr. Miller observed their numbers decline. “I was concerned about losing the population,” he said, “instead, they seem to be pretty resilient to drought.” That makes sense for plants that get burned and re-sprout. One thing that Dr. Miller studies, and I think this is pretty cool, are these food webs contained entirely within the leaves of pitcher plants. At the bottom of the food web are the decomposing bugs caught in the leaves. Bacteria break them down and they are eaten by single celled protozoa. Those are in turn eaten by mosquito larvae, which we of course find in any pool of standing water. 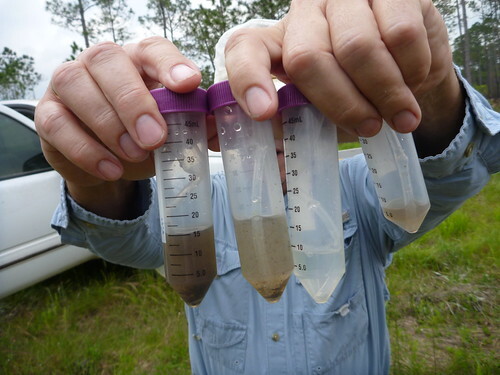 Samples taken from pitcher plants along S.R. 65. The one on the right is from a newer leaf, and is swimming with mosquito larvae. The one on the left has mostly the undigestable remains of ants, where as the one in the middle has both larvae and still edible insect remains. For more information on carnivorous plants in our area, Eleanor’s Flickr page is pretty helpful and fun to explore. Where there are flowers, there are bees. Our next EcoAdventure will feature more flowers and many more bees. We’re heading to the Dead Lakes, where the tupelo are in bloom and honey is getting made. Music in the piece by pitx and Greg Baumont.